The Rod Saver Vehicle Rod Carrier System holds 7 rods conveniently. Spring clips allow for easy removal for storage when not in use. Adjustable from 40" to 72". 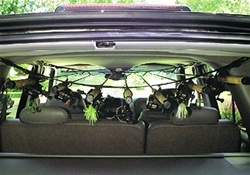 The Rod Saver design holds each rod individually and securely. Designed for all types and sizes of trucks, including pickups — from mini-vans to Suburbans. Virtually any kind of overhead, vertical or wall applications.